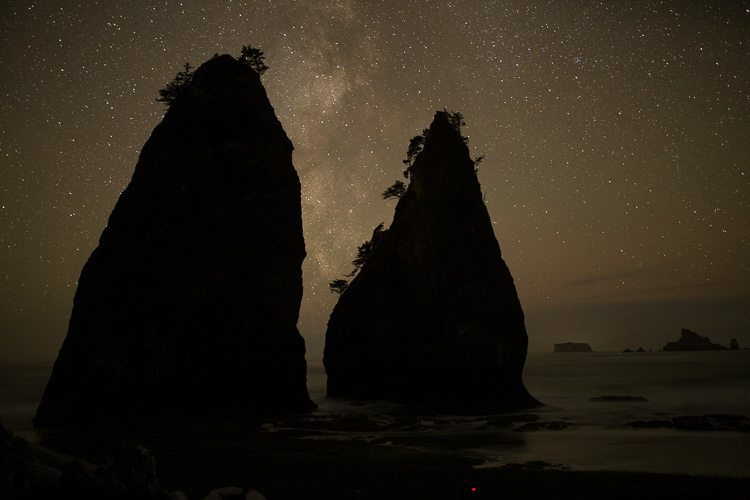 Most astrophotograhers would agree, it’s an endeavor that can disrupt your sleep schedule. 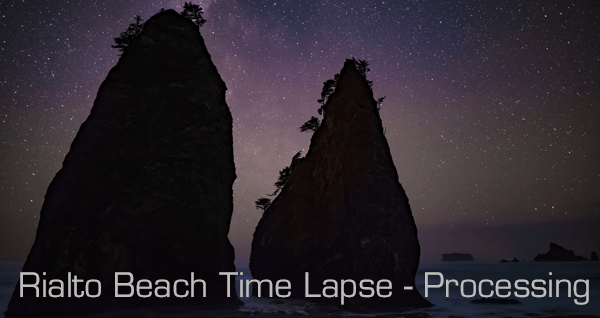 If you missed the previous post, on shooting the Rialto Beach Time Lapse, you can find it here. The first thing I had do was catch up on sleep. Then I had to relinquish my Northwest Astrophotographer hat briefly, and wear my Seattle Video Producer hat for a while. Once video production projects were in check, I turned my attention to the daunting task of processing all1129 images of this time lapse. Here’s an uncorrected image. As I mentioned in the previous post, I’d shot at 3200 ISO. This was the setting to get the color of the Milky Way. This yielded a challengingly dark landscape. Because this is video, I was considerably more aggressive than I would be with a still image. Here’s a screen grab of some of my selections. 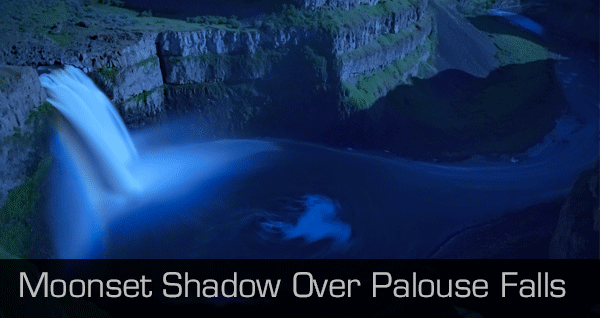 I bet there were some raised eyebrows over that 87 point bump for shadows! I was also aggressive with noise reduction and dehaze, then applied a slight crop to straighten and remove some junk. The beach was noisy, and had a purple tint to it, so I pulled out purple, added blue and went full throttle with noise reduction. 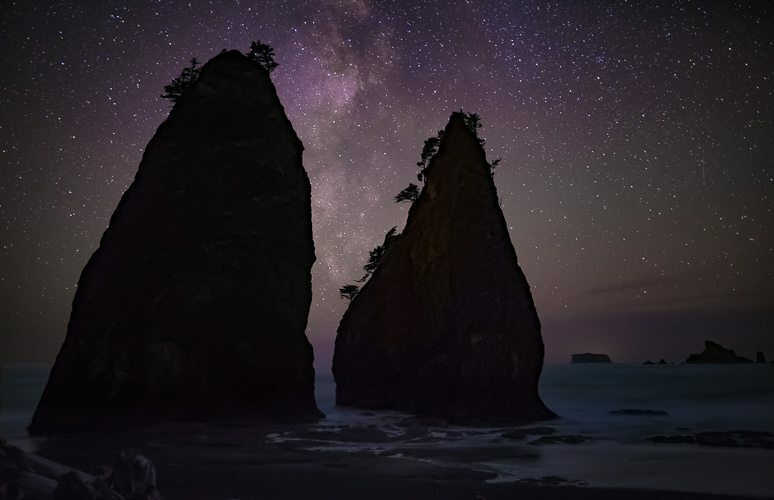 The stack on the right was getting a nice wash of warm light from light pollution down the beach, so I went with it, warming it up a bit and pulling up the shadows and highlights. The stack on the left looked muddy, with just enough detail to be a distraction, so I actually lowered the shadows and highlights. 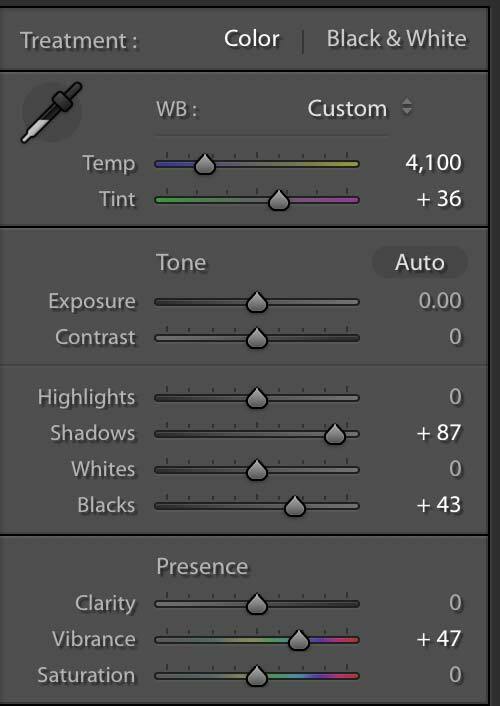 I output the images from Lightroom, then imported into Premiere, only to see hot pixels dancing all over the rocks and beach. One solution would be to drop a static image as a plate over the rocks, but that wouldn’t work for the beach, and would have been a lazy solution, so I opened the 1129 images, one at a time, and used the heal brush to fix the hot pixels. That’s four hours of my life I won’t get back, but it was the right answer. All fixed, out of LR, back into Premiere for another round. Here’s an output at this stage. It needs to conform to 1920 x 1080. I like that aspect ratio, and I know I’ll edit this into other media in the future. I wanted to bring more blue to the water, but not the beach. The challenge here is obvious – an area that late in the video is covered by the surf is bare beach earlier. My solution was to mask out an area in Premiere to lighten and bump up the blues in that region, then feather it in as an additional layer on the time line, as the water hits that region. I’ve probably watched this time lapse, at its various stages, over a hundred times. I’ve temporarily lost the ability to see it past the little things I wish I’d done differently. But I’ve had this experience before and I almost always come back a few weeks later wondering why I was picking on my beautiful creation. I have a list of do-betters, but I won’t share them here. What I will say is, if you haven’t been out to a dark place to watch the stars spin past, it’s an awe inspiring experience I recommend for everyone. Take pictures if you want, or just lay out a blanket and look up. Matt Krzycki is the Creative Director at GoodSide Studio, a full service Seattle video production company. 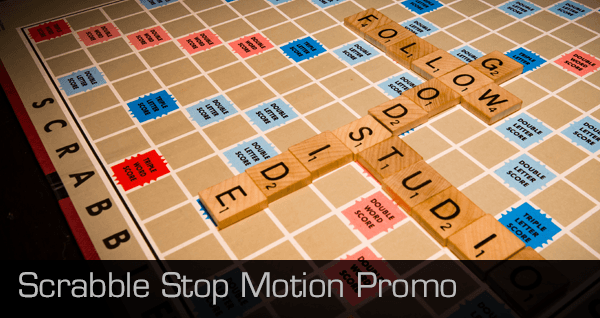 You can see his professional video production work here.